Set on 2 acres yet only 12km from Noosa's iconic Hastings Street! SPECIAL OFFER | For a limited time save 25% on accommodation charges for all bookings of 7 or more nights completed before 31st December 2019. ENQUIRE TODAY! Set on 2 acres with expansive, manicured lawns and towering eucalypts, Noosa Gums is a beautifully styled, luxury holiday home offering groups of up to 16 guests a peaceful, serene and totally private bush setting, less than 12km from Noosa’s iconic Hastings St! Noosa Gums is proudly managed by ellecor Holiday Home Management. The calendar is live, reflecting the home's true availability. Noosa Gums has a 3 NIGHT MINIMUM STAY year round, we do not accept 2 day bookings. Please contact ellecor if you have any queries about Noosa Gums or the surrounding area. I’m looking forward to hearing from you to discuss your accommodation needs. A destination in its own right, Noosa Gums’ back verandah overlooks the sun-drenched 100,000 litre swimming pool complete with swim up bar and day bed gazebo with the backdrop of palm and gum trees. Flowing through the property is Cooroibah Creek which allows guests direct access to the spectacular Noosa River system and glassy Lake Cooroibah by way of the home’s many kayaks. Sure to keep children of all ages entertained, Noosa Gums’ media room is equipped with Foxtel, Netflix, a DVD player, Wii and board games and the underneath of the home has been converted to a games’ room where guests can enjoy a game of table tennis or darts. And if that's not enough, outdoors there’s a 14ft trampoline, a full sized basketball hoop, soccer goals, bicycles, a fire pit area perfect for marshmallow roasting in the cooler months as well as kids’ body boards for use at the beach! Beautifully styled and furnished with quality décor and linen, Noosa Gums is perfectly suited to gatherings of families and friends with a large open plan kitchen, living and dining space. The fully equipped kitchen features a 6 burner gas hob, double oven and brand new dishwasher and French cabinet fridge, with a second fridge in the garage. Outdoors is a Weber Q BBQ and a dining setting allowing guests the option to dine outdoors on the verandah or indoors on the large, communal tables with large bench seats. This home is proudly managed by ellecor Holiday Home Management. The calendar is live, reflecting the true availability of the property. Please contact ellecor if you have any queries about Noosa Gums or surrounding area. The large master bedroom features a private balcony with deck chairs that overlook the pool and garden, a super king size bed and a sunken ensuite with spa bath and shower. The second bedroom has a super queen size bed, bedroom 3 features 2 king singles with 2 single mattresses below and the 4th bedroom which sleeps up to 8 is set up with 3 sets of single bunks, two with trundle mattresses below. All bedrooms have built in robes and quality linen including bath and pool towels are provided for all guests. Whilst the main bedroom has an ensuite area, a large bathroom with bath and shower plus a separate toilet/powder room service the additional 3 bedrooms. The large laundry is equipped with a washing machine, clothes dryer and ironing facilities and the property’s 3 clothes lines allow guests to make the most of the sunshine! The property has a septic waste system, so careful consideration must be given to the laundry products used. The home features quality furnishings, décor and linen throughout, ceiling fans in all rooms and security ‘crim-safe’ fly screens on all doors and windows, a study with WiFi, a double keyless garage, Coonara style wood heater in the main living area and portable heaters for the cooler months and countless thoughtful touches such as sunscreen and bug spray for guest use. The owners have ensured their guests will want for absolutely nothing whilst staying in their home. Noosa Gums - the ultimate luxury retreat to enjoy with family and friends! 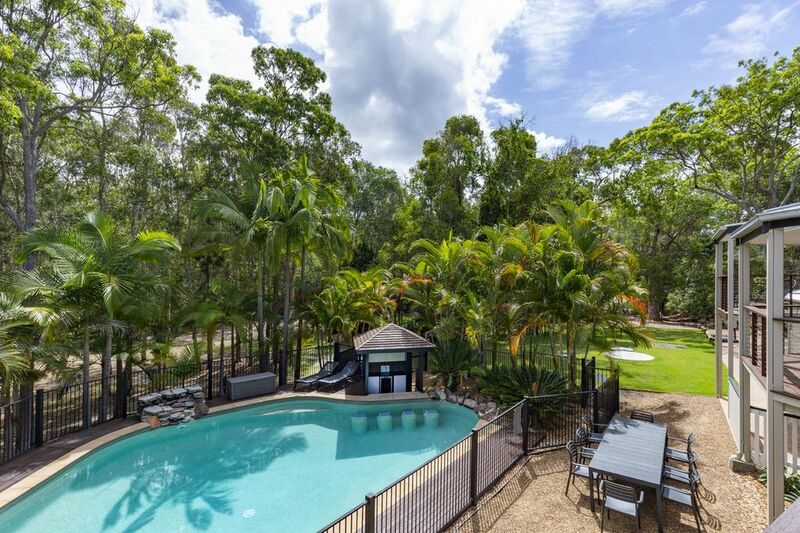 The 2 acre retreat is positioned in the Noosa Hinterland but is only 12km or less than 15 minute's drive to Noosa’s famous beaches and iconic Hastings St, a few minutes away from Tewantin and Noosaville’s Gympie Terrace and a short drive to Eumundi and its famous market. When staying at Noosa Gums the options for eating out are endless. Whether it’s the world class restaurants of Hastings Street and Gympie Terrace or more casual eateries in Tewantin and the Noosa Marina, all tastes are catered for. The Noosa shire is renown for its world-class surfing beaches with the internationally recognised ‘Noosa Festival of Surfing’ held annually in March. From point breaks to sandy beaches, beginners to advanced surfers, Noosa has it all. For those looking for outdoor activities other than the beach, Noosa Gums and its surrounds provide endless options including kayaking, mountain and road biking, horse riding, bushwalking, sailing and fishing. 4WD enthusiasts can easily access the Noosa North Shore and World Heritage Listed Fraser Island from the Tewantin car ferry – a 5 minute drive from Noosa Gums. To cater to those with a love of boating and fishing Noosa provides options for fresh water lake, river, estuary and surf fishing. Small tinnies can be launched directly from the property and larger crafts from the Noosa Marina complex in nearby Tewantin. Endless options for both road cycling and mountain biking are also at your doorstep. Noosa Gums is directly connected to Tewantin by safe cycle paths and Noosa Beach is a 30 min ride. Access to some of Queensland’s best mountain bike trails is from the nearby Tewantin National Park. A number of adult bicycles and helmets are available for guest use. If hiking’s your thing and early morning walk through the Noosa National Park to Hell’s Gates is a must! Be sure to also check out the Noosa Trail Network which is made up of eight scenic hinterland trails and don’t miss the Pomona King of the Mountain festival if you’re in the area in Winter! If you don’t have a car, Uber is readily available in the Noosa area and a trip to Hastings Street costs less than $20 or approximately $25 in a Maxi Taxi. Alternatively TransLink operate frequent bus services around the Noosa Shire. Translink's Journey Planner is available to help you plan your bus trip – visit Translink online or call 13 12 30. I’m Lauren, the Director of ellecor Holiday Home Management who specialise in professional short-term property management. Be assured if you book an ellecor property your travel experience will be seamless and hassle free! We pride ourselves on providing prompt, personalised and professional customer service and are always happy to help you with any queries you may have before, during or after your stay! I am an experienced real estate property manager and have also worked for many years in both the travel and customer service industries with a double degree in Tourism and Business Management. Further to this, I am extremely well versed with Airbnb and other holiday home listing sites, as I have owned and managed my own holiday home ‘The Queenslander’, located in Noosa Heads, Queensland since 2014. Unable to find a suitable managing agent for my home I created my business, ellecor Holiday Home Management. My passion for travel has taken me all around the world and I love that on a daily basis I am able to make other people’s travel dreams become a reality! The attention to detail blew us all away. We will be returning most definitely. The best weekend getaway we have had in years! A fantastic property for families or groups. Noosa Gums is a first class property. It has a thoughtful layout, a beautiful pool and is very well appointed throughout. The kitchen is very well equipped and the rooms all a good size and nicely decorated. Having kayaks on the property with direct access to the creek was an excellent detail, as was the rest of the games room. I would highly recommend this for families or groups. Myself and all our family and friends who stayed thoroughly enjoyed our visit even despite the rain. The place is very clean and spacious. The house accommodated for all our needs. A lovely big kitchen, media room, chilled living room and a massive table for us to enjoy our meals. We made use of the kayaks and pool which was a high light. Noosa Gums is the perfect home away from home! When we first arrived we were blown away by the house. The house was absolutely spotless (thanks to the wonderful cleaners). The decor and feel of the house made the house feel like it was our own home. We loved every second of our stay and would recommend this house to everyone. There was so much to do and we couldn't believe that the owners thought of everything. From toiletries to cutlery to games and entertainment, we did not need to bring a thing. Thanks as well to Lauren who made the booking so easy and the experience much easier. We recently stayed here with a large family group - 15 people! Everyone was so impressed with the property. So much larger than the pictures show! And in such wonderful condition, with a lovely homely feel. We loved it so much we are already planning our next visit... this time for longer! So many activities for everyone to do, so many areas to sit and enjoy the house, so much room - at no time did we feel like we were 15 people squeezed into a house. If you are contemplating booking this property you totally should! ..... you won’t regret it! Myself and a big group of friends stayed at this house over the weekend of the Noosa Marathon so we could be close to Noosa main beach as some of us were competing in the marathon. The house blew us away! It was even better than the pictures. There was an extra 3 beds to what we were expecting, the pool bar was fantastic, the disco room was a lot of fun and we took the kyak's out on Saturday afternoon. This property would suit groups of adults or families wishing to spend the weekend together, but also have moments on their own. Also not to mention, the kitchen and dining table was fantastic for feeding everyone and was incredibly well stocked. We will definitely be returning!